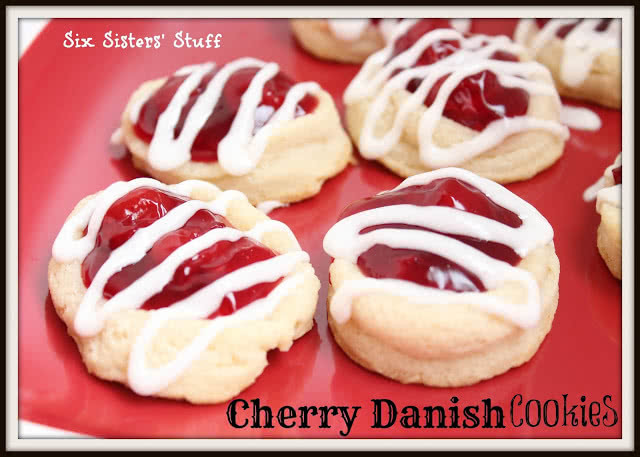 These Cherry Danish Cookies are easy to make and taste like little cherry pies, but better, because the cookie is so sweet and delicious. If you are a cherry fan, this is definitely a recipe you will want to try. These cookies taste like you are eating a Cherry Danish. So, I guess that means you can eat them for breakfast without any guilt! Our families loved them. These cookies are perfect for Valentine’s Day or a yummy cherry dessert on President’s Day. This recipe is adapted from Jamhands. what other pie filling could you make this recipe with? I love cherries. Especially in the summer time, there is no better fruit. I love when they pop in my mouth and how sweet and delicious they taste. If you are looking for a simple and delicious cherry recipe, this is definitely one you need to try. If you don’t like cherries, or can’t eat them for some reason, don’t panic, you can easily substitute them for another pie filling. Really any favorite pie filling would work for this recipe. You could also use fresh fruit if you are looking for a lower sugar, option. These cookies do freeze well. However, we do not recommend stacking them. We also recommend placing them in an airtight container, or a large ziplock bag, with all the air sucked out of it. These will be good in the freezer for about 2-4 weeks. Beat butter, cream cheese, milk and sugar together. Then add egg yolk. Stir flour and baking powder into butter mixture to make a stiff dough. Works best if chilled overnight or for a few hours. Roll out dough 1/4" thick. Cut into circles with a 2 inch round cookie cutter. Place on ungreased cookie sheet 1" apart. Make an indent in each cookie with your thumb and fill with 1 teaspoon of cherry pie filling. Bake 10-12 minutes. Cool completely. Mix powdered sugar and milk. If it's too runny add more powdered sugar. If too thick, add a little milk. Mix until smooth. Put glaze in a sandwich baggie with the corner snipped off. Pipe the glaze onto the top of each cookie. Oh yum. I might add a tiny bit of almond extract to the cookie dough. I LOVE almond and cherry together. Oh. My. Wow. I love these! These look like little danishes! Yum!! I'm thinking this would be great with apple pie filling. YUM-again! These look great! I love anything with cherries, but I bet you could add any pie filling flavor. You gals were my inspiration for my linky party! These look delicious and oh so pretty! I'd love for you to come over to Finding the Pretty & Delicious Linky party and share your fun idea Party closes Tuesday evening! 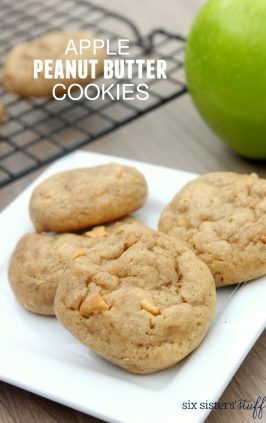 I just started making these and saw that the only sugar in the cookie itself is 1 Tbsp. Has anyone else made these and if so, I would love to know if 1 Tbsp of suger works? It really is just 1 Tablespoon of sugar. These are so moist and delicious! Awesome....Thank you for your respose. They are in the refer right now and I can't wait to bake them. I know this will be one of my husbads favorite. I love cherry anything and everything. These cookies look fantastic. I made these and they were delicious. I also made them using apple pie filling that I diced. Will make again. Next time I will try almond extract to the dough as suggested by other comments. Try adding a little more flour to the dough and see if that helps. 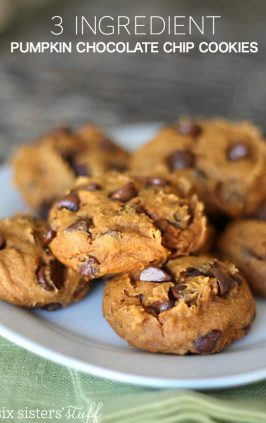 I want to make these cookies, they look so good! My question is....if you roll it out to 1/4", how does that give you any room for indenting enough to be able to fill it?? Hi Linda, just press each cookie to make a little indent. 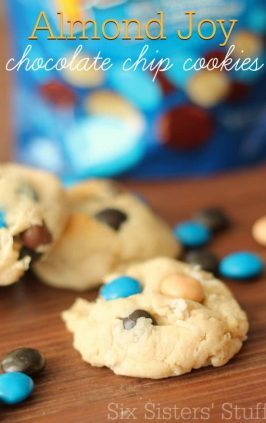 You don't want to push hard and break through the dough to the cookie sheet. A teaspoon of cherry pie filling isn't very much. Maybe 2 cherries max and some cherry gel. Hope it all goes well! Merry Christmas! These are so good! Can I freeze them? These cookies should freeze fine in an airtight freezer container.